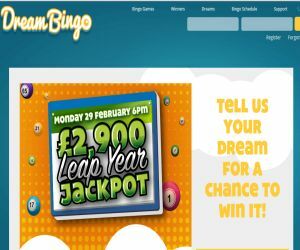 Dream Bingo's Leap Year Jackpot | Win up to £2,900! We waited four years for this! It's finally a leap year, which is possibly is the most exciting and confusing day of the year! It means we get a whole extra day of February, and for anyone who is actually born on 29th, you can finally celebrate your birthday! It also means tomorrow isn't March the 1st, and your whole schedule might be very confusing. So we're giving you a heads up! Luckily, you can also leap into riches with Dream Bingo‘s £2,900 Leap Year Bingo Extravaganza! Since the 29th of February only comes around once every four years, the Dream Team at Dream Bingo has decided to celebrate in style, with a fully-loaded type of promotion that only comes around once every four years! With the February Leap Year Extravaganza, now you won't have to just day-dream of winning your fortune! You can head to the actual Day Dreamer room to live the dream from 6pm on February 29th, and play 10 fun-packed games to win a share of the £2,900 jackpot! The jackpot can be won in 36 calls, and if there is no winner, the call number will be multiplied by 2 and the jackpot will decrease by £290 until one lucky day-dreamer scoops the juicy jackpot. If game 10 starts before the jackpot has been won, then the call number will be transformed into a Full House, which will probably not happen again for another four years! To leap into the festivities, you can pre-buy tickets for the big games, which will start at 6pm on February 29th. You can buy tickets for as little as 29p, and if you want to buy a stash of 6 tickets, you can collect 2 Free! Dream Bingo is also bursting with dreamy promotions like the £4K Juicy Jackpot, the 1000 Spins Giveaway and more!